So what’s new? iPhone 7 dramatically improves the most important aspects of the iPhone experience. The best performance and battery life ever in an iPhone and the brightest, most colorful iPhone display. 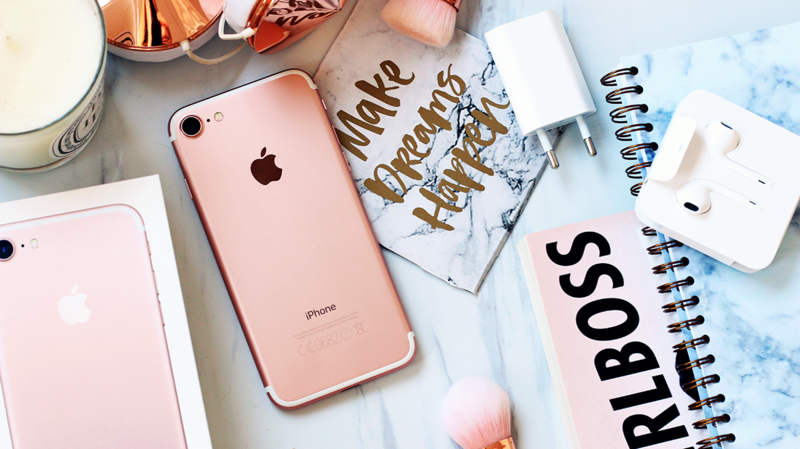 Available in jet black, black, silver, gold, and rose gold, iPhone 7 features an all-new 12MP camera. It’s also splash, water, and dust resistant, has an A10 Fusion chip, a new Retina HD display with wide color, better stereo speakers and is compatible with iOS 10. When it comes to the ‘outside’ however, the iPhone 7 hasn’t changede that much. The size of the iPhone 7 is 138.3 x 67.1 x 7.1 mm and it weighs 138 grams. My gold iPhone 6 is 138.3 mm x 67.1 x 6.9 mm and weighs 129 grams. Compared to the iPhone 6, the iPhone 7 is almost identical to the iPhone 6. But, it’s the inside that counts, right? 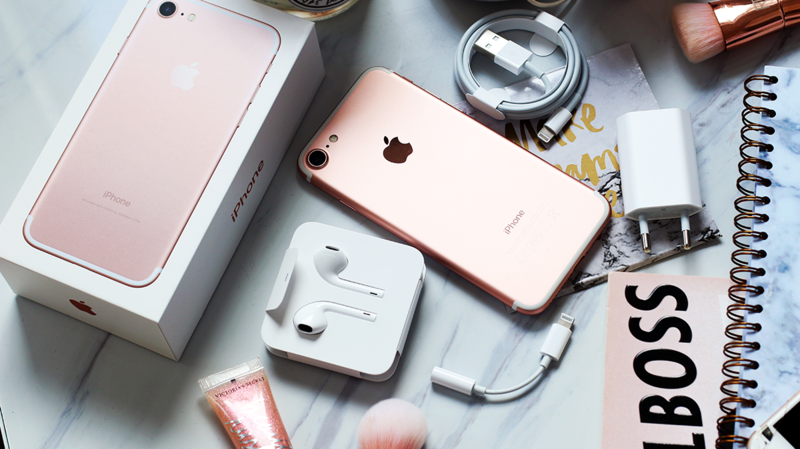 The iPhone 7 comes with an adapter, charger, earphones without a normal ear jack and an adapter for your headphones. The iPhone 7 now only has one Lightning connector port and that’s it. That means you can’t use your normal headphones without the adapter anymore ánd you can’t charge your phone and listen to music at the same time. I really dislike this change, especially because I’m charging my phone all the time and same goes for listening to music… You can buy a separate adapter with two Lightning ports, but that’s a pretty bulky and unhandy thing. I will purchase it eventually, but it’s still a hassle. Instead, iPhone 7 has now two speakers instead of one. You can definitely tell the difference when it comes to the quality and volume of the sound. So that’s fortunately a nice improvement, but I’m not sure if I find that more important than having 2 different ports. I’m sure I will get used to it though. 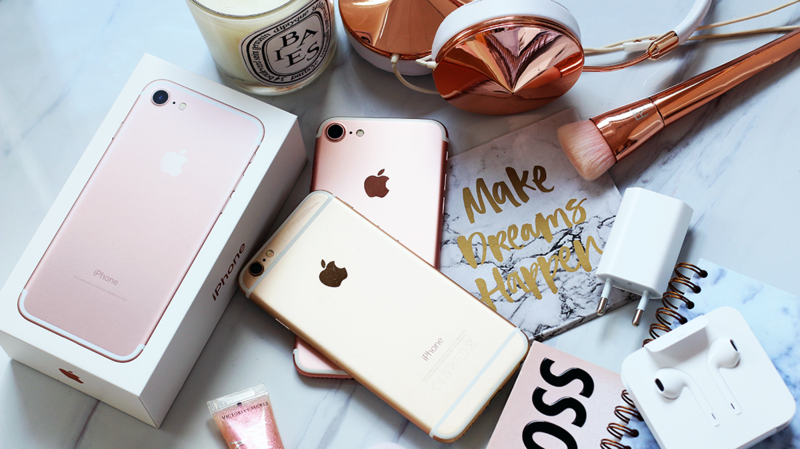 Also, I feel like the iPhone 7 is an essential for every (fashion) blogger out there. 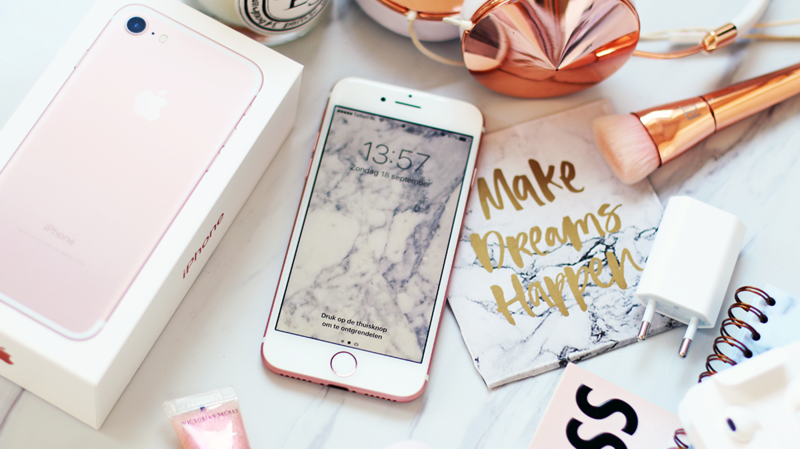 Investing in a good phone is one of the best blog tips I can give you! Sometimes it’s a hassle to to bring your camera with you, but then you stumble upon the perfect OOTD location with the best lighting: a phone with a good camera such as the iPhone 7 will safe the day. Also, nowadays media like Snapchat and Instagram Stories are also very important to keep up with. 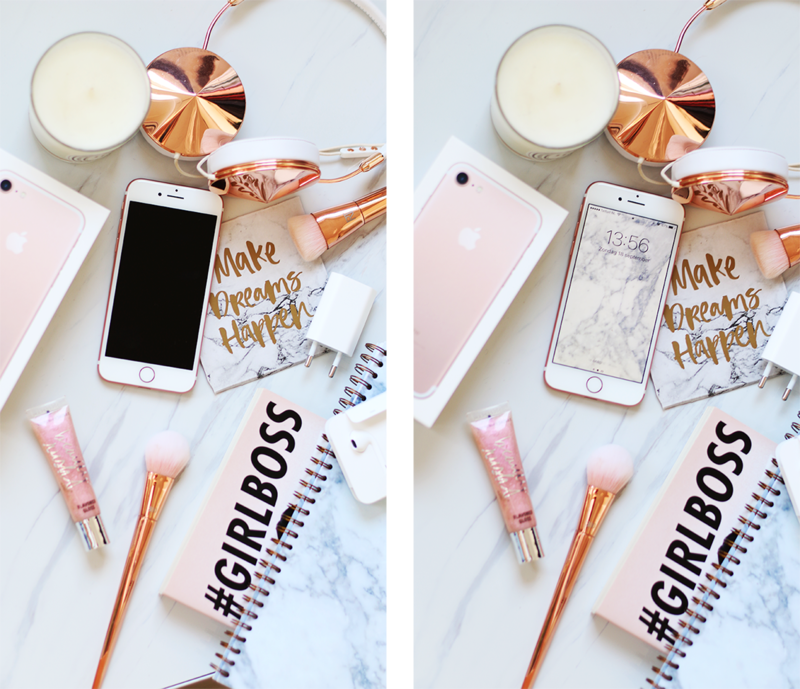 The media are only accessible through your phone, so having a device that takes stunning photos is a must if you want to gain a good following there. 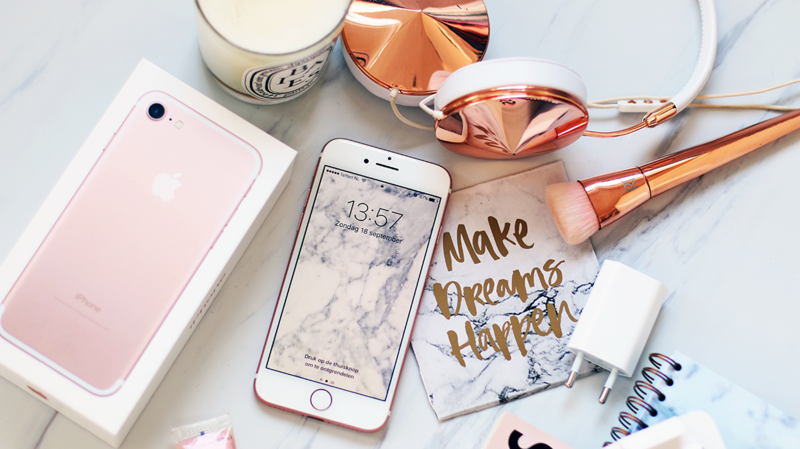 So yeah, investing in a good phone is definitely a must if you want to be an online influencer/blogger! 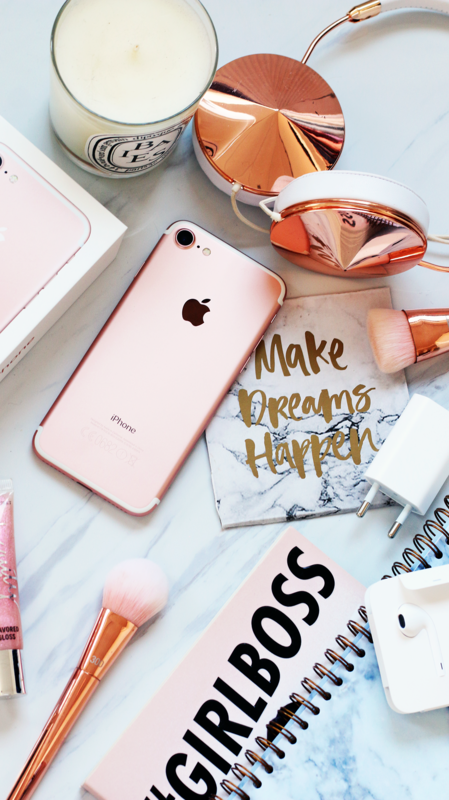 ARE YOU PLANNING ON GETTING THE iPHONE 7 ROSE GOLD? Noooo dit wil ik dus NIET lezen. Ik heb net een maand geleden de iPhone 6S Plus gekocht omdat de mijne toen kapot was. Balen! It’s sooooo pretty! I’m kind of iffy about it not having the earphone jack though. It looks gorgeous but I just got a new phone half a year ago so I’ll probably keep this one till it dies haha. PS- your photos are always of such incredible quality! Naomi in Wonderland recently posted…New in 2017: Star Wars Season of the Force in Disneyland Paris! I really wonder why apple opted out to remove the audio jack from the latest iphone model which is iphone 7. Overall iphone 7 is really a great smartphone though it is a little expensive, I think the specs it offers is good for the price. I just don’t understand the reason behind removing audio jack and having to buy an audio adaptor for it. What do you think is the reasom behind this? I love u…. U are so motivating and inspirating…. Traded the 6 in for the 7. I know many people are about waiting til the rumored “10th anniversary” version next year, but my wife and I have been on a 2 year cycle with the iPhones and we will stay in that 2 year cycle. I love the fact that this phone is water resistant and that the processor is REALLY FAST. And so far kudos to apple for FINALLY upgrading that camera. Ik heb deze ook nog steeds en ben zo blij met de rose kleur. Ik vind dit toch wel een aparte look geven hoor. Classy en vrouwelijk! Mariëlle recently posted…Festival outfit en nieuwe maxi jurk!